Circa 1894. This elegant inn features three Queen Anne Victorians, a Coach House and three cottages surrounded by fountains, gazebos and lush flower gardens. 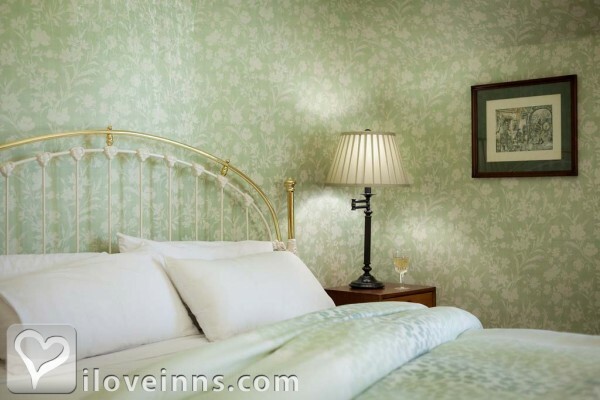 The guest bedrooms and suites are furnished with English antiques, Laura Ashley fabrics and wallpapers or oak floors, pine furniture and down comforters. 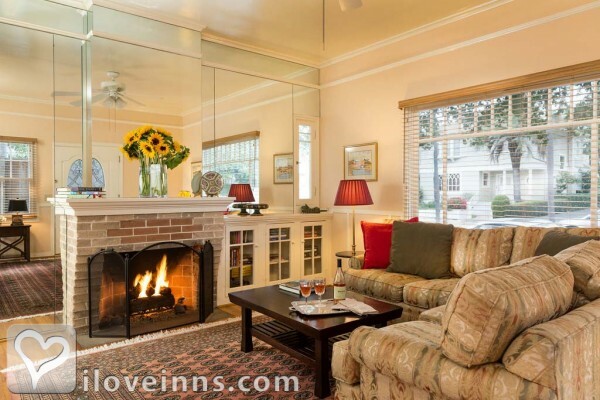 Some boast fireplaces, Jacuzzi tubs, private balconies, VCRs and refrigerators. Wedgewood china set in the formal dining room or brick patio enhances a delicious breakfast. Local wine and hors d'oeuvres are served in the evening. Spa facilities offer massage and body treatments. Payment Types Accepted Include Master Card, American Express, Discover, Visa, Personal Checks and Travelers Checks. 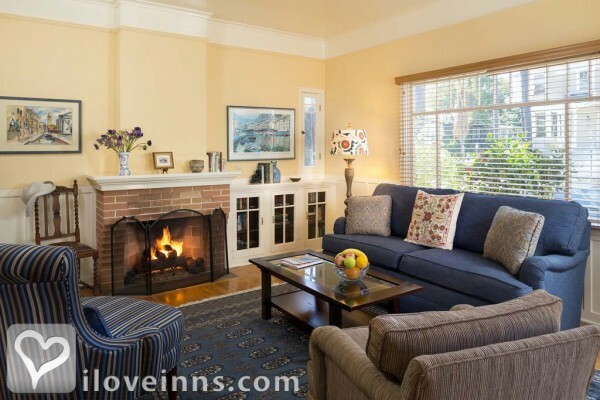 This property has 18 total guest accommodations with private bath, 3 with fireplaces, 1 with hot tub, 4 two-bedroom suites, 4 cottages and 1 conference room. The types of beds available include Twin, Queen and King. Bramhall Cottage rental is a 628 square-foot cottage featuring 1 queen and 1 twin bedroom with French doors which open onto a private woodsy patio, a fully equipped kitchen, dining nook and air conditioning. This most recent addition also offers hard wood floors, living room with fireplace, flat screen TV/DVD and a large bathroom with tub/shower combination. When making your reservation, please specify whether one or 2 bedrooms are desired. Rates include breakfast, as well as afternoon wine and appetizers. 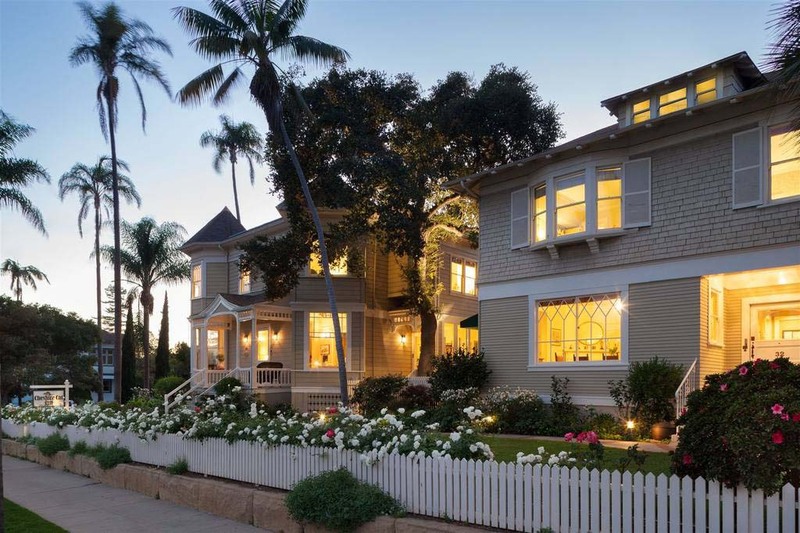 Mobberly Cottage is our most secluded Santa Barbara vacation rental featuring 628 square feet, 1 queen and 1 twin bedroom with French doors that open onto a romantic private patio. The cottage has a large bathroom with tub/shower combination, hard wood floors, living room with fireplace, flat screen TV/DVD, fully equipped kitchen, dining nook and air conditioning. When making your reservation, please specify whether one or 2 bedrooms are desired. Rates include breakfast, as well as afternoon wine and appetizers. Prestbury Cottage rental is a 628 square-foot cottage featuring 1 king and 1 queen sized bedroom which opens on to a romantic private deck, a large bathroom with tub/shower combination, living room with fireplace, flat screen TV/DVD, fully equipped kitchen, dining nook and air conditioning. When making your reservation, please specify whether one or 2 bedrooms are desired. Rates include breakfast, as well as afternoon wine and appetizers. 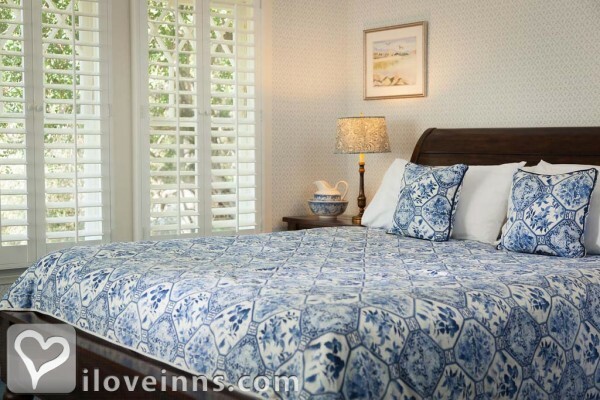 Woodford cottage is a family favorite featuring 1 king and 1 queen sized bedroom which opens onto a private patio. The 628 square-foot cottage has a large bathroom with tub/shower combination and hard wood floors, living room with fireplace, flat screen TV/DVD, fully equipped kitchen, dining nook and air conditioning. When making your reservation, please specify whether one or 2 bedrooms are desired. Rates include breakfast, as well as afternoon wine and appetizers. 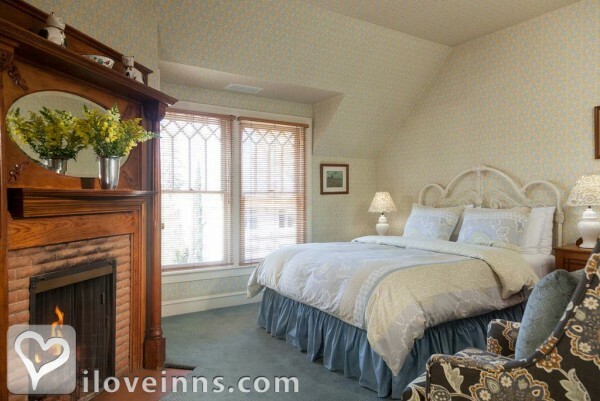 The Tweedledum suite provides a stunning and luxurious setting featuring a large bedroom with an in-room bay window Jacuzzi and a living room with rustic oak beams, hard wood floors, elegant rugs and English antiques. 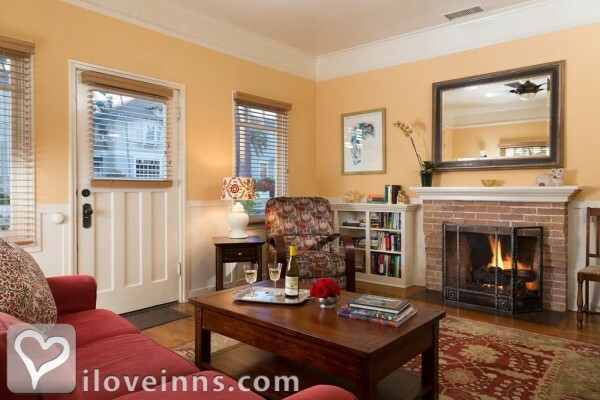 This perfect romantic setting also offers a gas burning fireplace, comfortable furniture, a private bathroom with tub/shower combination and a wet bar/kitchen with microwave, toaster oven, electric kettle and refrigerator for added convenience. This 543 square foot suite has two flat screen TV/DVD's, large walk-in closet and air-conditioning. Rates include breakfast, as well as afternoon wine and appetizers. The elegantly furnished Tweedledee studio is a spacious 309 square foot room featuring soft garden hues, light wood flooring, king size bed, private bathroom with tub/shower combination, flat screen TV/DVD and air conditioning. The wet bar/kitchen offers an authentic English oak farmhouse table and chairs, microwave, toaster oven, electric kettle and refrigerator. Rates include breakfast, as well as afternoon wine and appetizers. 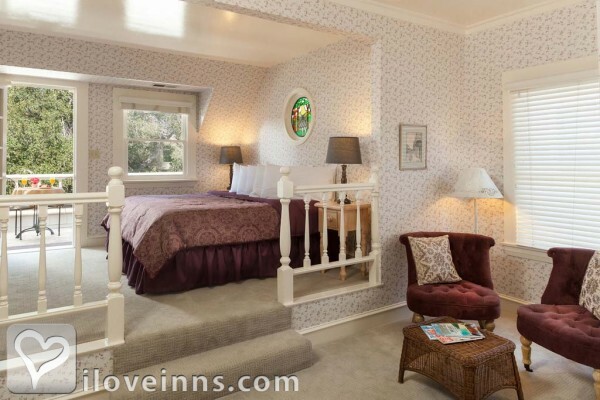 The split level White Rabbit room is similar to Alice's room features a sitting area and king bed area that opens onto a secluded deck overlooking our beautiful English gardens and the Santa Ynez Mountains in the distance. The spring like room decor in primrose yellow and sapphire blue color combination make the room light and airy. This 264 square foot room offers a private bathroom with shower and flat screen TV/DVD, and an antique corner cupboard. Rates include breakfast, as well as afternoon wine and appetizers. This is Alice's namesake, decorated in pink, grey, and ivory wallpaper for a peaceful atmosphere, as well as a delightful stained glass rendition of Alice lovingly crafted by a local artist. 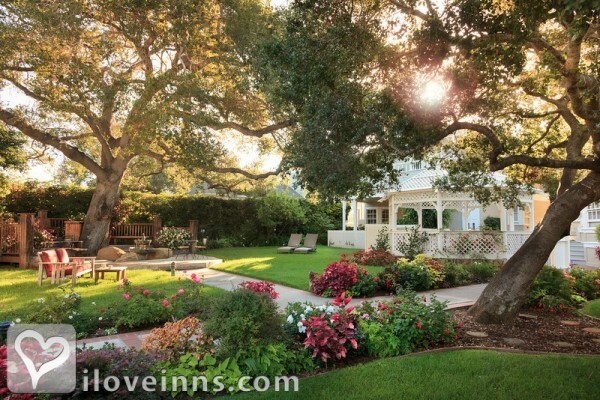 The 237 square-foot spacious split-level room features a sitting area and king bed area that opens onto a secluded deck overlooking our beautiful English gardens and the Santa Ynez Mountains in the distance, and a private bath room with shower and flat screen TV/DVD. Rates include breakfast, as well as afternoon wine and appetizers. 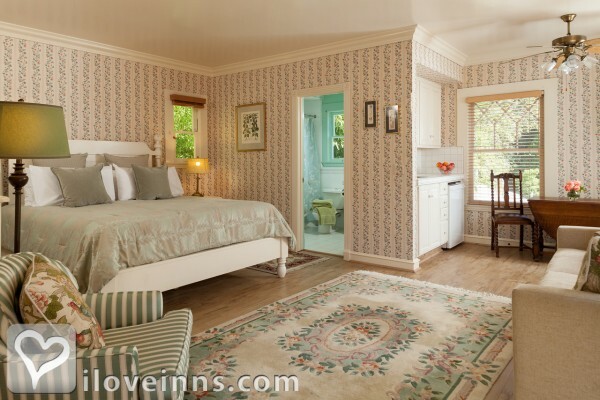 The Queen of Hearts room, with its own entrance through a private flower filled garden, offers ultimate romance perfect for a honeymoon stay or quiet getaway. 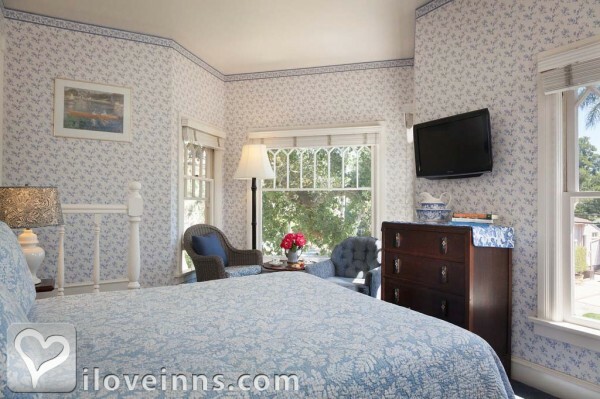 The 227 square-foot room features a king bed with shower and flat screen TV/DVD, as well as a sunny bay window and comfy chairs that provide a relaxed atmosphere and a great spot for enjoying a good book. Rates include breakfast, as well as afternoon wine and appetizers. The Eberle room is inspired by the building's architect and a spiritual retreat to Santa Fe. The Eberle is decorated in earth tones and terracotta tile flooring, and features a beautifully tiled Jacuzzi tub and gas burning fireplace that provides a relaxing atmosphere. This 240 square foot room offers a queen bed, flat screen TV/DVD and private bathroom with shower. Rates include breakfast, as well as afternoon wine and appetizers. Rates include breakfast, as well as afternoon wine and appetizers. The enchanting and intimate Dormouse room features a sloping ceiling, wooden floors, gas burning fireplace and original mantelpiece. 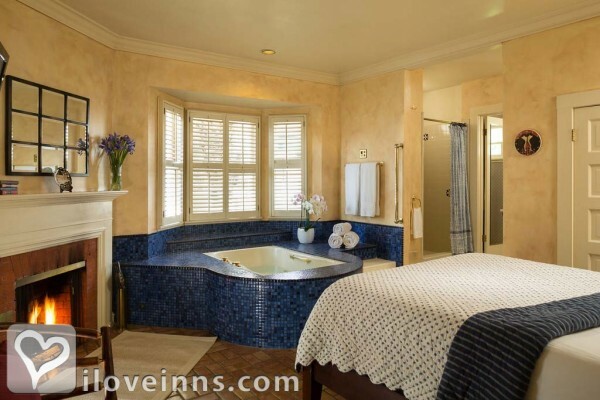 Decorated in smoke blue, terracotta and cream, this 160 square foot room offers a queen bedded brass bed, private bathroom with shower and flat screen TV. Rates include breakfast, as well as afternoon wine and appetizers. The romantic March Hare room features an open bay window sitting area that gives this room its unique character. 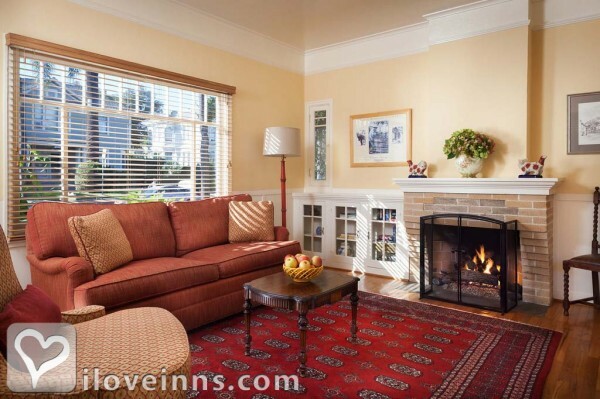 This 176 square foot room is decorated with sunny yellows and green bramble furnishings, and offers a queen bed, private shower and flat screen TV/DVD. Rates include breakfast, as well as afternoon wine and appetizers. 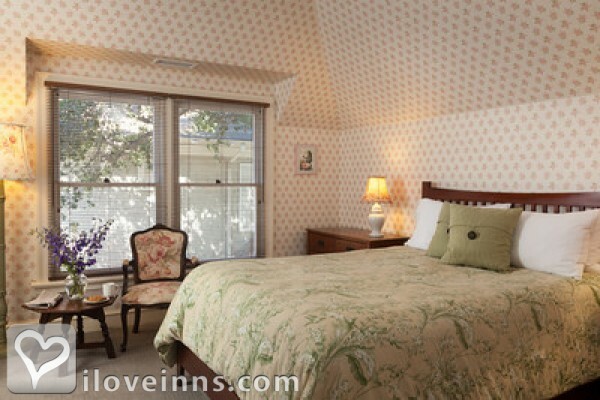 The 193 square foot Duchess room features attractive lightly flowered wallpaper on the ceiling and walls, a Queen bed, antique armoire and a spacious bathroom with a soaking tub and shower and a flat screen TV/DVD. Rates include breakfast, as well as afternoon wine and appetizers. 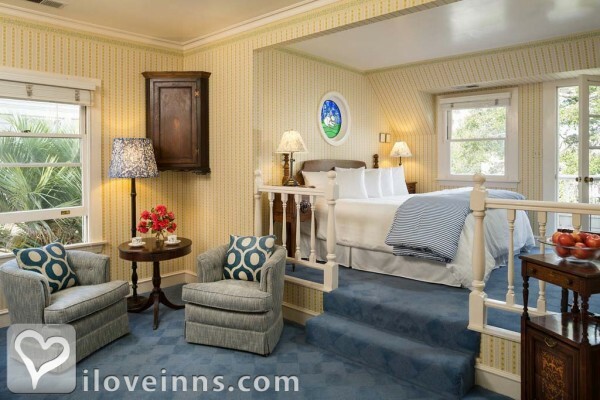 The renovated Cheshire Cat room features high ceilings with beautiful handcrafted woodwork and a sumptuous walk-in shower for two with heated tiled floor. Rich wood furnishings complement the light and airy decor in this 208-square-foot ground-floor room that offers a comfortable queen bed and inviting sitting area. Rates include breakfast, as well as afternoon wine and appetizers. 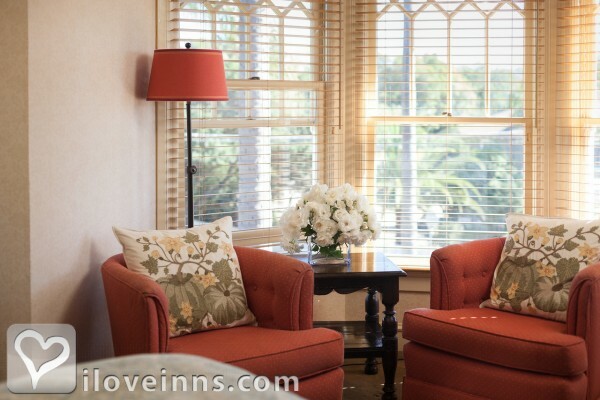 The charming split-level Caterpillar room features pretty window seats and a queen bed and sitting area opening on to a large private deck overlooking our beautiful English gardens and the Santa Ynez Mountains in the distance. 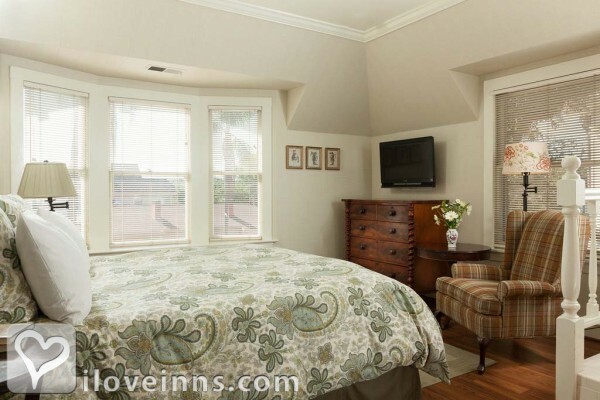 This 215 square foot room offers a private bathroom with shower and a flat screen TV/DVD. Rates include breakfast, as well as afternoon wine and appetizers. 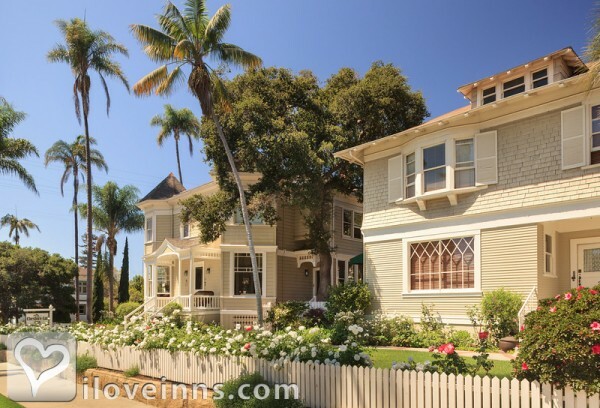 My wife and I made a trip to Santa Barbara to initiate a real estate transaction. It was supposed to be strictly a business trip. 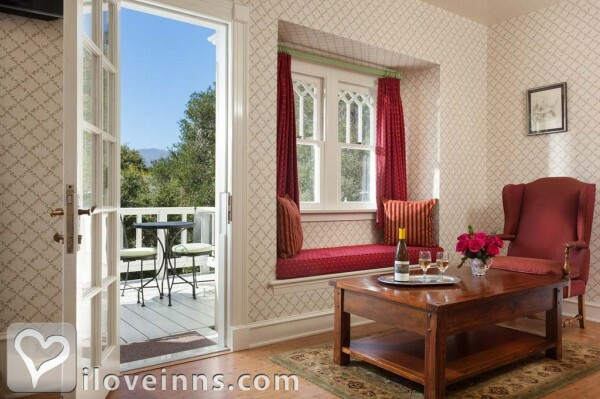 We booked a room for two nights at the Cheshire Cat Inn and our business trip quickly turned romantic. Our room was charming, the grounds were extremely well kept and the staff was fantastic as were the breakfasts and the goodies they fed us. We especially appreciated the many thoughtful suggestions of things to see and do and eat... We will be going back!! We keep coming back to the Cheshire Cat And leave with a grin that is broad and fat. It�s wonderful, charming, the evening hors d�oeuvres, And Bharti�s a beauty, the pleasure she serves. 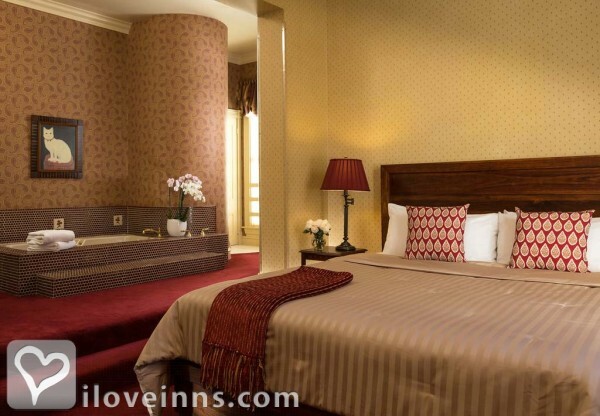 We�ve tried many rooms, although one is our favorite, The Queen of Hearts ambiance, so much do we savor it. The breakfast is ample with long conversation, Our getaway weekend or weekday vacation! We had a wonderful stay. The staff was very gracious and the food was delicious. Room was perfect too! Loved our stay - perfect accommodations in the cottage for our girlfriend getaway and easy walk to State Street with all the restaurants and shops. Prize winning quiche served for breakfast - amazed at the delicious variety of hors d'oeuvres served with Santa Barbara wine. Two on the Town, KABC, Los Angeles Times, Santa Barbara, American In Flight, Elmer Dills Recommends.